This book is part of the Pearson Automotive Professional Technician Series. 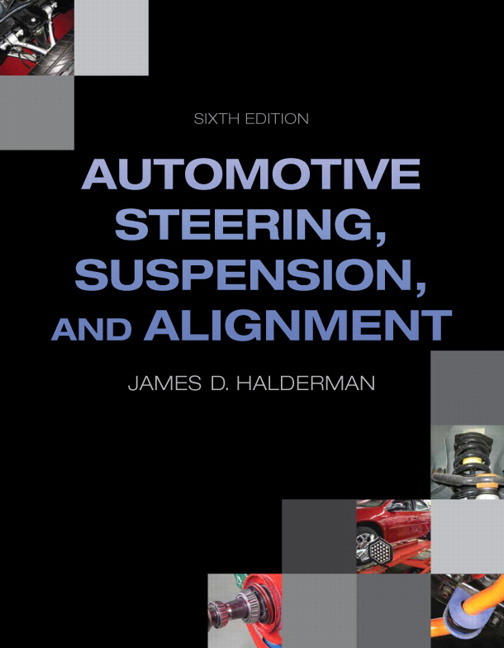 This title is designed to be a one-semester text and covers the fundamental, as well as the advanced automotive steering, suspension and alignment topics taught in all schools and colleges. Automotive Steering, Suspension and Alignment, 7/e covers all of the fundamental and advanced issues and topics in automotive steering, suspension and alignment, as well as the practical skills that students must master to be successful in the industry. Written by a service technician and an automotive instructor—not a technical writer—and fully in line with the trend toward using more electrical and electronic components on vehicles that control the operation of the engine, the text is revered as the best available text on the subject. Formatted to appeal to today's technical trade students, Halderman’s text uses helpful tips and visuals to bring concepts to life and guide students through the procedures they'll use on the job. To keep your course current, all of the content is correlated to the latest NATEF MLR, AST, and MAST designated topics of Automotive Steering, Suspensions and Alignment (A4), and new or updated information is included on tire selection, chrome clad wheels, using a pin plate to balance wheels, snap-in and clamp-on TPMS sensors, updated relearn procedures, various wheel weight material, wheel flange, and a Hi Per strut. Present topics in short, easy-to-read chapters. 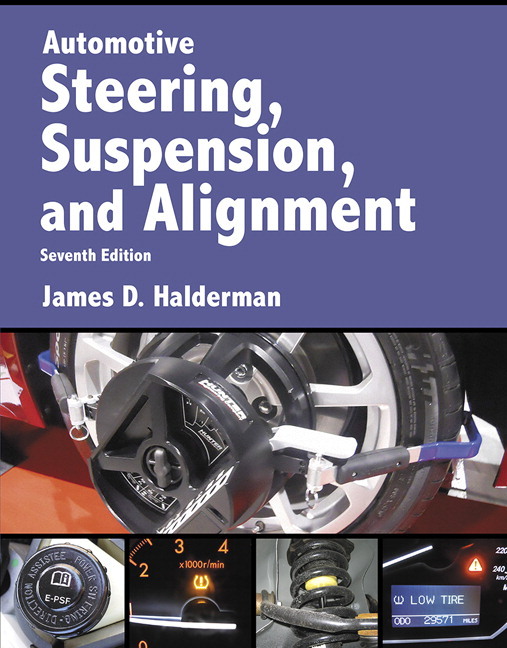 Automotive Steering, Suspension and Alignment Systems, Seventh Edition makes teaching and learning easier by breaking the content into small, manageable segments. It features twice as many chapters as competitive texts so that a topic or an entire short chapter can be assigned and taught instead of assigning individual page numbers or questions. UPDATED: Visualize concepts with full-color photos and line drawings. Over 40 new full-color line drawings and photos have been added to help bring the subject to life. The photos show the actual parts involved so that the student can view a good or defective part. The line drawings allow the reader to see what is inside a component and how it works. UPDATED: Make reading, studying, and content mastery easier. Every chapter includes new bulleted and numbered lists to summarize concepts or the steps in a procedure, while the new design for main and sub-headings makes it easier to grasp the scope of the chapter. Finally, each chapter ends with a Summary, Review Questions, and a Quiz. Answers to chapter questions can be found in the Instructor’s Manual. NEW: Case Study features, previously Real World Fix, now include the “Three Cs”, Complaint, Cause and Correction. They present students with actual service scenarios and show how the problems were diagnosed and repaired. Two new Case Studies are included in Chapter 8 to give readers more insight into these real-world concerns. UPDATED: The power steering chapter is now two separate chapters—Hydraulic Power Steering Systems (Chapter 13) and Electric Power Steering Systems (Chapter 14) for easier teaching and learning of these topics. NEW: Tire selection, chrome clad wheels and using a pin plate to balance wheels topics are included in Chapter 3. NEW: Various wheel weight material plus wheel flange information is included in a totally updated Chapter 5. NEW: New information is included in Chapter 7 on Hi Per strut. Supplement your course with a full instructor support package. To make teaching from this text easier, textbook adopters have access to a downloadable TestGen computerized Test Bank, Image Bank, and presentation slides. Get up and running quickly using the Instructor’s Manual.Thedownloadable Instructor’s Manual contains Sample Syllabus, NATEF Task List, Chapter Outline, and Answers to chapter questions. Use the additional teaching notes keyed to the textbook page numbers to help you prepare to discuss, review, preview, and reinforce important content. Visualize concepts with full-color photos and line drawings. Over 40 new full-color photos and line drawings bring the concepts to life. Make reading, studying, and content mastery easier. Every chapter includes new bulleted and numbered lists to summarize concepts or the steps in a procedure, while the new design for main and sub-headings makes it easier to grasp the scope of the chapter. Illustrate important concepts using real-world examples. Case Study features, previously Real World Fix, now include the “Three Cs”, Complaint, Cause and Correction. They present students with actual service scenarios and show how the problems were diagnosed and repaired. Two new Case Studies are included in Chapter 8 to give readers more insight into these real-world concerns. The power steering chapter is now two separate chapters—Hydraulic Power Steering Systems (Chapter 13) and Electric Power Steering Systems (Chapter 14) for easier teaching and learning of these topics. Tire selection, chrome clad wheels and using a pin plate to balance wheels topics are included in Chapter 3. Various wheel weight material plus wheel flange information is included in a totally updated Chapter 5. New information is included in Chapter 7 on Hi Per strut.